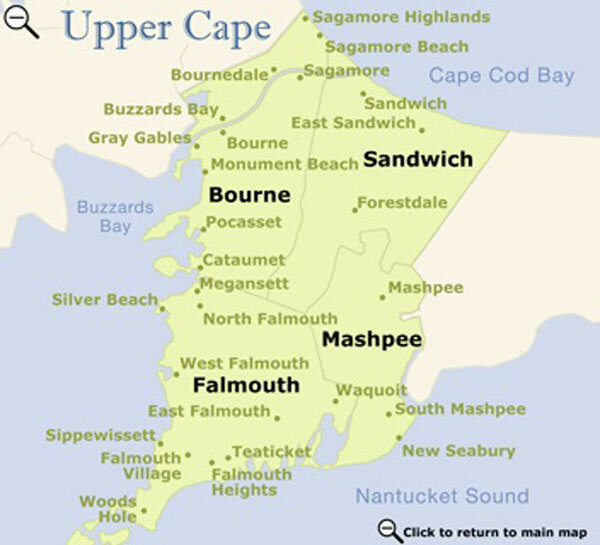 Cataumet is one of the nine villages of Bourne, the others being Bourne Village, Bournedale, Buzzards Bay, Gray Gables, Monument Beach, Pocasset, Sagamore, and Sagamore Beach. Cataumet is on Buzzards Bay, with Pocasset to the north and Falmouth to the south. The nearby Cape Cod Canal is known for its 7-mile walking and bicycle trails. The Hy-Line Canal Cruise is a popular activity. Scraggy Neck, a private community in Cataumet, has security guards during the summer. Members and tenants have access to beaches, tennis courts, playground, boat launches. Though quiet and peaceful, Cataumet is only a 20-minute drive to downtown Falmouth or Mashpee Commons, with their many shops and restaurants.